We are pleased to present our Top 30 Coffees of 2014, Coffee Review’s second annual ranking of the most noteworthy coffees we reviewed over the past year. We selected and ranked these exceptional coffees and espressos based on quality (represented by overall rating), value (reflected by most affordable price per pound), and consideration of other factors that include distinctiveness of style, uniqueness of origin or tree variety, certifications such as fair trade and organic, and general rarity. This year’s list actually includes 31 coffees. Two coffees share spot No. 29 because their roasters, without intending to, sourced the same exceptional green coffee, brought it to an identical roast color based on Agtron readings, and even charged the same price. Reassuringly, perhaps, these two versions of the same coffee also earned the same score in separate blind cuppings a month apart. In 2014, we cupped thousands of samples and published roughly 350 coffee reviews. Approximately eighty of the reviewed coffees scored 94 points or higher. Obviously all of the 94+ point coffees were exceptional. But we couldn’t include them all, and some were more unusual or noteworthy or better values than others. Obviously some outstanding coffees were left off the list; on the other hand, every coffee on the list is remarkable or exciting in some way. Regular Coffee Review readers will recognize many of the roasters and coffees appearing on the Top 30 list. 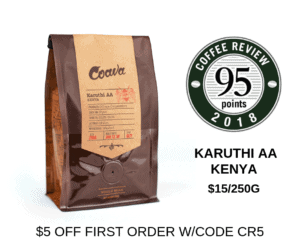 Fourteen of the coffees were sourced and roasted by Coffee Review advertisers, though that played no role in their original scoring or in their selection to the list. The average overall rating of the coffees on the Top 30 list is 94.8 out of a possible 100. The average price is $37.98 per pound, although many coffees high on the list cost considerably less. Three coffees on the list were priced less than $18 per pound, and half cost less than $25 per pound. The most expensive coffee on the list sold at a whopping $120 per pound. Of the ten coffee-producing countries that appear on the list, Ethiopia and Kenya dominated, with seven coffees each. Other origins with multiple coffees on the list are Panama (3), Colombia (3), Nicaragua (3), and Sumatra, Indonesia (2). Two coffees grown in the United States made the list: a coffee from Kona in Hawaii, as well as the first commercially grown coffee from California. Roasters from four countries appeared on the list: United States (27), Taiwan (2), South Korea (1), and Hong Kong (1). In the United States, coffee from California roasters dominated the rankings this year, with thirteen representatives overall, including four of the top five. Roasters from Sacramento, California, placed four coffees in the 2014 Top 30 list. In terms of number of appearances on the list, the rich got richer in 2014. In 2013 no roaster appeared on the list more than once, whereas this year five roasters appeared on the list twice: Bird Rock Coffee Roasters, JBC Coffee Roasters, Klatch Coffee, Old Soul Co, and Temple Coffee and Tea. Two coffees from Klatch Coffee appeared in the top five. There were no decaffeinated coffees on the Top 30 list in 2014. There was only one blend, No. 7 Holiday Blend by Olympia Coffee. There was only one coffee designated for espresso brewing, No. 22 SO Espresso Brazil Fazenda Rainha Natural by Paradise Roasters. The trends in high-end coffee that prevailed in 2013 seemed to have intensified in 2014: fewer blends (though we detected a swing back toward two-coffee blending toward the end of the year), more refined and specifically identified single-origin coffees, and more coffees processed by the dried-in-the-fruit or “natural” method (a surprising total of fourteen). An impressive number of coffees made the list that were produced exclusively from one variety of tree, including five from the rare Gesha (or Geisha) variety, three from the heirloom Bourbon variety, two from the big-beaned hybrid Pacamara, one from the similarly big-beaned Maracaturra, and one from the Caturra variety. If we look at tree variety generally as a crucial differentiator in cracking the Top-30 list, then we might add to these Geshas, Bourbons, etc., the seven coffees that appear from Ethiopia, which were almost exclusively produced from trees of very ancient varieties native to Ethiopia, and the seven Kenya coffees on the list, all of which were primarily produced from the heirloom, Bourbon-related SL 28 and SL 34 varieties. Looked at this way, twenty-seven of the top thirty-one coffees had as a likely driving differentiator the variety of tree from which they were produced. However, one of the selection criteria for the Top 30 coffees was value or affordability, measured by price per pound. Many of the coffees on the list are priced in line with similar single-origin specialty coffees. Nearly half of the coffees on the list cost $24 per pound or less. Given that a pound of coffee produces the liquid equivalent of close to one case of wine, this means some of the best coffees in the world are priced less per serving than the famous (or infamous) Charles Shaw “Two Buck Chuck” wine. The three most affordable coffees on the list are the No. 22 Paradise S.O. Brazil Espresso ($12.95/12 ounces), No. 6 Topéca Ethiopia FTO Worka ($14.50/12 ounces) and No. 28 Equator Colombia ($15.35/12 ounces).